The Custom Highlight Drop comes in a simple 15ml glass bottle equipped with a convenient dropper dispenser. The bottle opening is smaller than usual so I find it a bit tricky to pull out and re-insert the glass dropper without getting the rim dirty. Additionally, the liquid highlighter is quite viscous, so you won't actually be able to get equal-sized, individual droplets from the dropper. I feel like a pump bottle or even a squeeze tube may have been a better choice for the formulation. 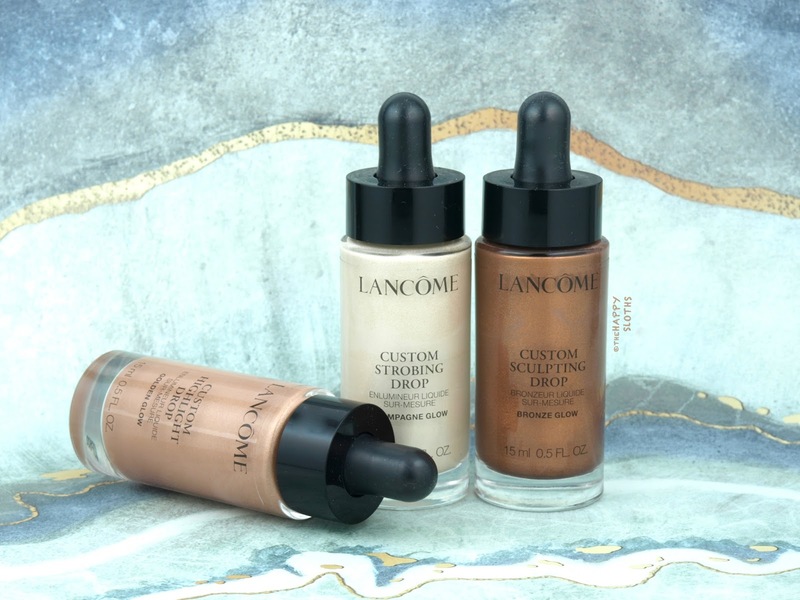 Available in four shades (Champagne Glow, Rose Glow, Golden Glow, and Bronze Glow), the Lancome Custom Glow Drops is a multi-use liquid highlighter with a lightweight, water-based formulation. The product can be mixed with foundation for a subtle, allover glow or it can be applied over makeup as a highlighter or bronzer. All four shade contains a fairly pigmented pearly base, in addition to a light sprinkling of golden micro-shimmers. The pigmentation is definitely there but I wouldn't call these "Ultra-Concentrated". The formulation applies nicely over foundation but it does not blend well over any powder products (ex. setting powder, powder blush). As someone with oily skin, a good powder is a must for finishing up any look but I find that with powder on top, the Custom Glow Drops significant loses their shine. Therefore, these are only suitable if you like that dewy, no-powder look. The formulation is fairly smudge-proof but only if applied very sheerly. If built to a more concentrated sheen, there will be transferring and fading. Overall, the Custom Glow Drops is a pretty liquid highlighter. However, the idea is not original and I'm not loving the formulation. Despite being reasonably pigmented, the golden shimmers in all the colors are a bit excessive and I don't like how the formulation doesn't work well over powder. 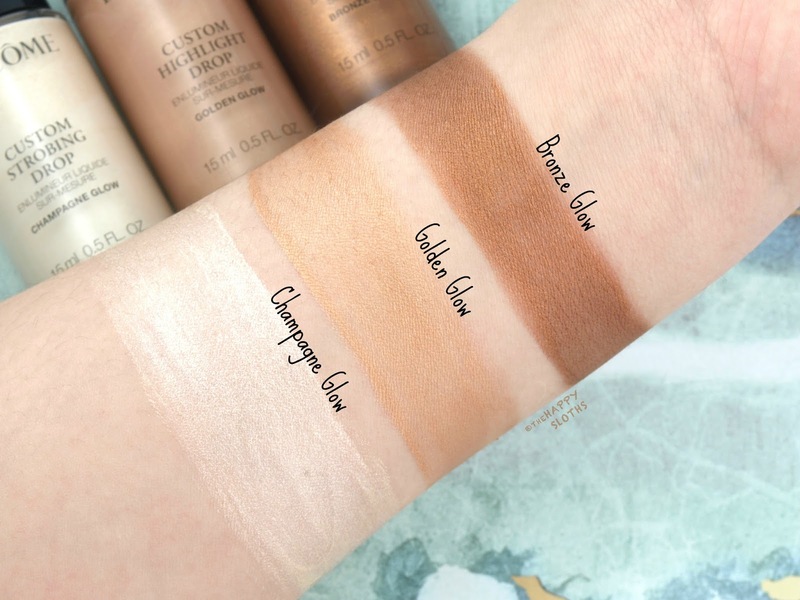 If you want something similar to these that are longer-wearing and easy to blend, I would check out the L'Oreal True Match Lumi Liquid Glow Illuminators (reviewed here). See below for a breakdown of three shades from the line. Champagne Glow: This is a very pale white gold shimmer scattered with subtle gold sparkles. The color is definitely not what I would associate with a champagne shimmer and it is sheerer than expected. Golden Glow: A soft golden bronze, Golden Glow has both shimmer and sparkles. This one is great for those looking for a more bronze-y highlight. 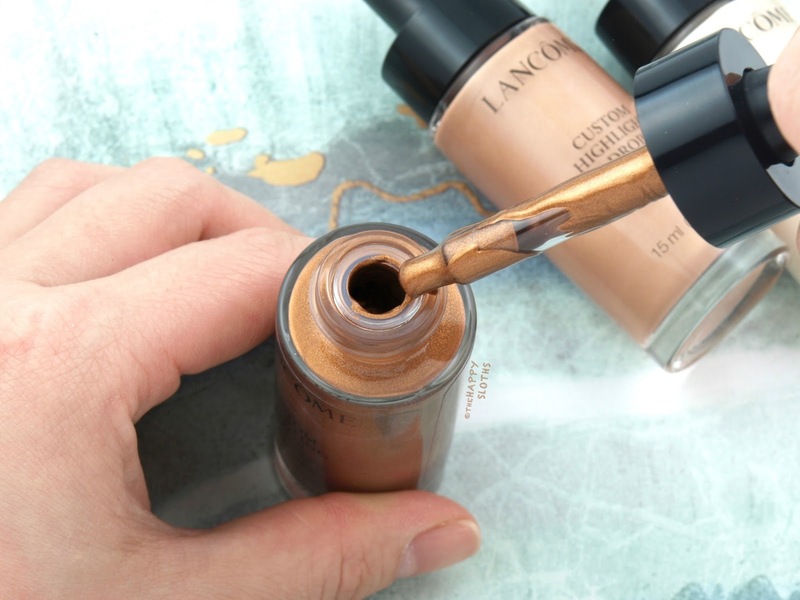 Bronze Glow: Hands down the most pigmented shade of the three, Bronze Gold is a deep bronze sheen sprinkled with a subtle dash of golden sparkles. This is suitable for those with medium to dark skin tones. 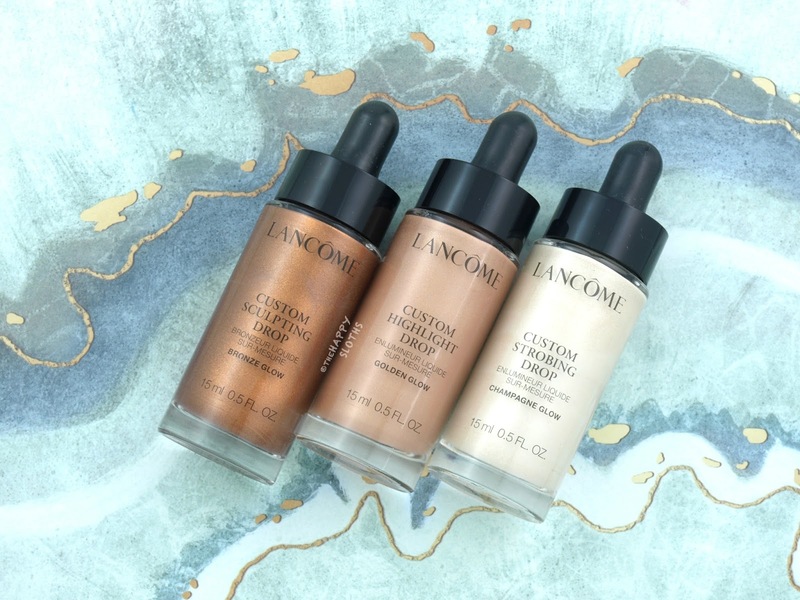 Lancome is available online and in stores at Sephora, The Bay, Shoppers, London Drugs and www.lancome.ca.